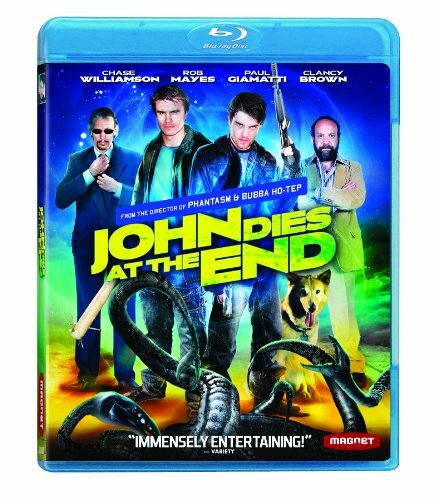 Adapted from David Wong's audacious trans-genre horror novel, JOHN DIES AT THE END with screenplay by and directed by Don Coscarelli (BUBBA HO-TEP) and also stars Clancy Brown, Glynn Turman and Paul Giamatti. Magnolia Home Entertainment is the home video division of Magnolia Pictures. Launched in November 2005, the company releases a diversified slate of films both under Magnolia Home Entertainment and the Magnet Releasing label, including Lars Von Trier's Melancholia, Kevin Macdonald's Marley, Rob Reiner's The Magic of Belle Isle,Andrew Rossi's New York Times documentary Page One, David Gelb's Jiro Dreams of Sushi, Jay Baruchel's Goon, the SXSW Official Selection Conan O'Brien Can't Stop, James Marsh's Academy Award(R) winning Man on Wire and Academy Award(R) nominated documentary Food, Inc. Magnolia Home Entertainment is part of a vertically-integrated group of media properties co-owned by Todd Wagner and Mark Cuban that includes distributor Magnolia Pictures, the Landmark Theatres chain, production companies HDNet Films and 2929 Productions, and high-definition cable networks AXS.tv and HDNet Movies. For more information visit http://www.magpictures.com.